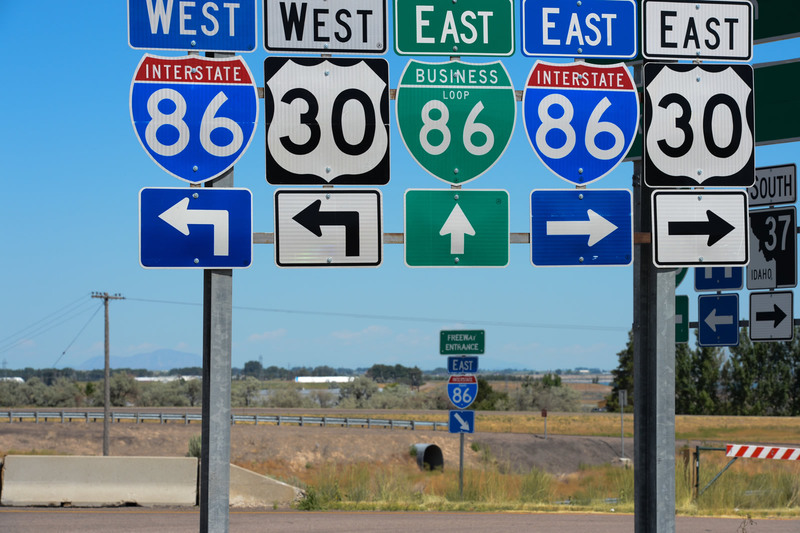 Interstate 86 has a business loop on the western section. None others will be designated, as New York does not use Interstate business routes and the short stretch in Pennsylvania is rural. 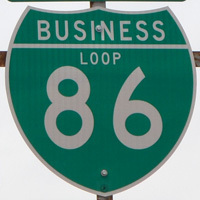 Business Loop I-86 provides access to American Falls as Interstate 86 & U.S. 30 bypass the city to the south. The 5.34 mile route overtakes the former northern extent of Idaho 37 along a frontage road east from Exit 36. Veering away from the freeway, Business Loop I-86 takes Lincoln Street and Fort Hall Avenue (old U.S. 30N) to the American Falls city center. There the business route turns west onto Idaho Street (old SH 39) to span a set of Union Pacific Railroad tracks and intersect Idaho 39. Idaho 39 and Business Loop I-39 encircle the north side of American Falls to Pocatello Avenue. A short distance east of there is the joint terminus of the highways at Exit 40 and Lakeview Road (old U.S. 30N). Historically, old U.S. 30N took a slightly different path than Business Loop I-86. Whereas Business Loop I-86 turns left at Idaho Street in Downtown American Falls, old U.S. 30N (later U.S. 30 when U.S. 30S was eliminated in 1972) followed Fort Hall Avenue east one more block, then turned south on Harrison Street and southeast on Pocatello Avenue toward a rendezvous with Idaho 39. 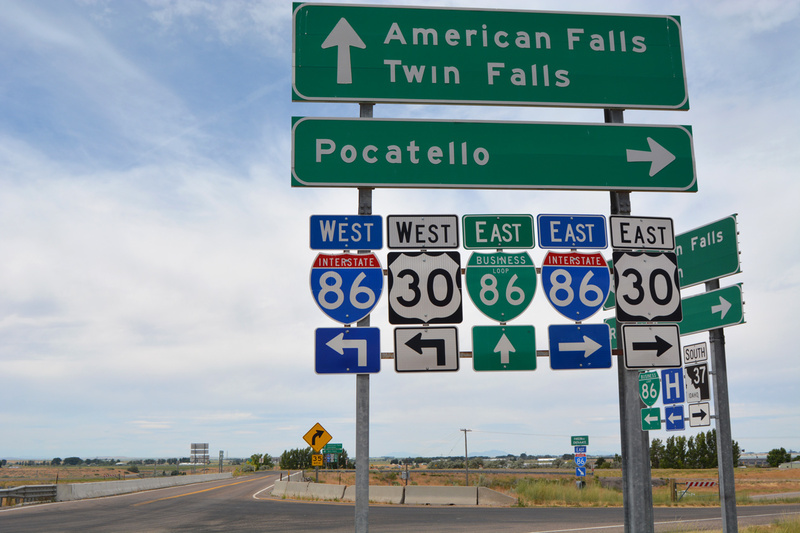 This old alignment is no longer state maintained, as Idaho 39 bypasses American Falls along side Business Loop I-86. 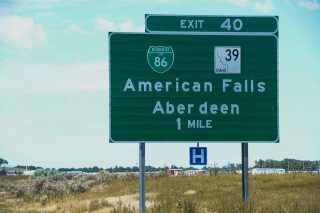 Nice array of signs at American Falls, ID. Page updated August 30, 2016. American Falls represents the last service center along Interstate 86 & U.S. 30 west. The ensuing 45 miles to I-84 are mostly devoid of motorists services. Photo taken by Jeff Royston (07/15/13). 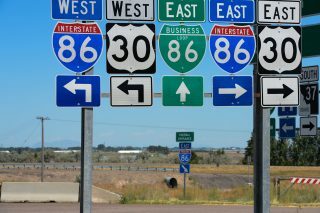 Idaho 37 meanders north from Rockland to end at Interstate 86 & U.S. 30 opposite Business Loop I-86 east to American Falls. Photo taken by Jeff Royston (07/15/13).